Johnny joins us this evening to speak about the Hegelian dialectic, false left-right paradigm, and the illusion parading as reality. 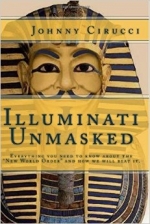 The author of two books, Secret History and The Illuminati Unmasked. In this show we speak about his journey to awakening and how that voyage ties into facing the reality of government-sponsored terror, false flag terroristic events, controlled opposition, and even the perpetuation of the grand deception that is the Darwinian heliocentric paradigm of an ever expanding universe where the earth as one of nine planets just happen to be at the right place to evolve life in random circumstance. We will be doing a follow-up to this deeply profound show in three weeks time until then God bless.